It's been an exciting few weeks. First of all we went to Manila to do some errands and it was so nice to be "home" again with my parents for a little while. One of the biggest reasons for going to Manila was to pick up some medicine we were ordering from a company that sells to mission organizations like ours at a much cheaper price. We had no idea what the total was going to come out to, but the day before we went to pick up the meds, we received some money that a church in the States had donated specifically for the medical work and what a surprise when it turned out to be almost the exact amount that we needed! God is good! As soon as we got back we made final preparations for a couple weeks of mobile clinics to some remote PFM (Philippine Frontier Mission) projects across Palawan. The first morning we left early and Dwayne dropped me off at the first project called "Tagbenwa" north of here near Aborlan. 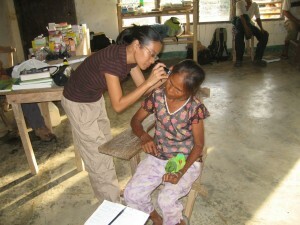 Then he hopped over to Aborlan and picked up, Karlah, the young Filipina doctor who had come to help us. There is only one, single missionary guy working at the Tagbenwa tribe at the moment, but his partner is on the way now. 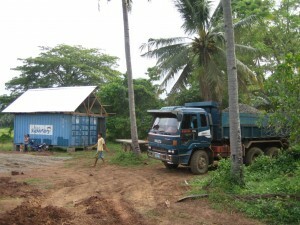 They have one family there that has accepted the good news and they have started building a church, but have run out of money. 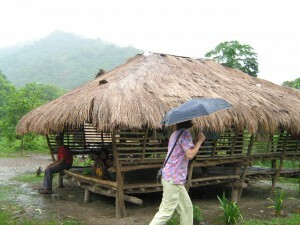 It is very remote--4-6 hours hike to the nearest anything. They had no running water and minimal solar electricity. Karlah and I attempted to modestly bathe in a trickling stream at night with guys watching. All food, pretty much has to be carried in (no rice available and minimal produce). We had very simple, but tasty meals cooked slowly over coals. That was the way it was for all the projects we visited. The missionaries slave over the coals or open fire with smoke in their eyes for hours to prepare their meals. All of them had to haul water. Some all the way from another island! These are true missionaries! Some had phone signal and others didn't. They all have simple, solar electricity to run their radios for communicating with the other missionaries and supervisors. We focused on natural remedies and lifestyle changes and the people seemed open to this and especially loved the missionary's animated health lectures he gave using some health charts we had picked up in Manila. We also prayed with each patient, reminding them that God was the only one that could truly heal them. The main problem in most of these villages is Malaria. We used more Chloroquine than anything else. The Tagbenwa tribe as well as the projects down south are different enough from the dialect that I learned in Kemantian that we could not really communicate much. 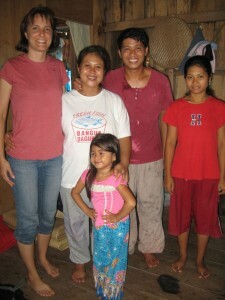 Luckily most of them knew Tagalog and Karlah was able to speak with them. Monday morning Dwayne and I left early again to head down to Balabak and Bancalaan, the islands at the very south of Palawan. Eric took Karlah down as far as they could by truck and Dwayne came back and picked her up after he dropped me off. We had some determent with rain and winds, but thankfully all went well in the end. Dwayne left me in Balabak saying "I don't have enough fuel to get back! Hope I don't fall into the ocean!" so I was very thankful to hear them flying in a few hours later! (He was able to reroute and land in a different place than originally planned). Southern Palawan is pretty much an all-Muslim area. On Bancalaan everyone carries M16s around. Seriously! Some were worried about our safety down there, but we didn't sense any problems. 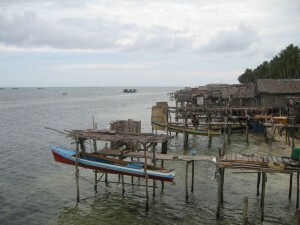 They are mostly fishing villages, making their money by illegally dynamite fishing and the black market between the Philippines and Malaysia (which is only a few hours boat ride away). 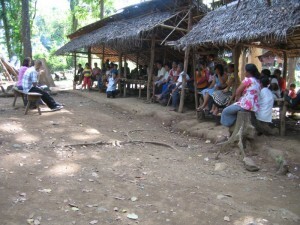 There were a fair number of true Palawanos from the mountains there also so I could communicate with them. They were much more needy than the others who had money from their illegal fishing. Once again, though, the problem is lack of education. They still live very unhealthful lives and yet they think they need medicine to cure everything and they have the money to buy it. The medicine is very expensive, though, so they just buy a few pills and don't take the full courses. They weren't as excited with our charcoal and vitamins and wanted "real" medicine, but we only gave "real" medicine to those who really needed it. Many of them just had colds and needed to drink lots of water and do steam inhalation, etc. We did lots of education on that and on the use of medicine, but I think they could use a full seminar on health next time. Dwayne talked to them about putting an airstrip down there so they can be reached easier for mission groups to come and help them. The island is mostly flat. It takes a couple hours' boat ride to the nearest town. It's another couple hours to Brooke's Point and another 5 hours to Puerto Princessa. 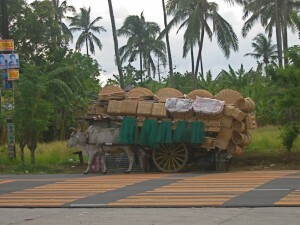 Bancalaan was a very interesting experience. The houses are all out over the ocean, or at least their toilets are! It is a little unnerving to walk out to the bathroom while everyone watches you--and then the walls are only up to your waist and the hole goes straight into the ocean, so I'm not sure if you'd really call that privacy! The missionaries there had no bathroom or kitchen yet, so we had to use the neighbor's bathroom when they were awake or around. They have a belief that you should not use the bathroom on the land because it will contaminate it. It is sad, because all the kids play on the shore and under the houses, eating the snails and crabs and sea foods, gathered right under their toilets! The place is crawling with kids. They don't believe in family planning so they just keep multiplying. The kids weren't shy there like they have been in most of the places we've been so far. You couldn't turn away for a second and they'd be climbing in and on the helicopter, playing with the controls and pulling on the ropes that tied the rotarblades down! They were really cute, though, not as malnourished as most remote places around here. Rainy season was starting so we had some big, gusty rain storms almost every night and some during the day. But, thankfully not enough to deter too many patients except on one day. We saw around 400 patients down there. We could have seen more, but time and medicines were running out. Our time in Bancalaan reminded me of life back in Kemantian a little, with people and patients coming to our door constantly. I felt for the missionaries there who have to deal with it round the clock. They are real troopers. They have one 4-year-old and another baby on the way. We had one inpatient while we were there and Wednesday night, the night before we left, we had a night call to a laboring woman on the other side of the island. That was an adventure! Karlah and I rode on the back of a motorcycle driven by one of the missionaries. The road was rough and muddy and the headlight went out on our way back! It was all fun, though and we were happy to minister to the family there. The lady was not in true labor yet and she was just a little nervous and breathing fast, but after a little time chatting with the family, taking pictures and praying with them, she said "I don't feel bad anymore!" so we left and were able to get a good rest before our last day. Thursday I woke up a little sick, no surprise after the conditions we had been in. I had intestinal issues and ran a low grade fever all day, but praise God he healed me enough to finish the rest of the patients. I got to experience being a patient in the stretcher on the way back (we made it back in one trip since we were lighter with less meds and fuel). I had been hoping to see the giant turtles that Dwayne has seen a couple times in that area but I was too wiped out and didn't care too much anymore and just kinda slept the whole way back. Preparations are still going on for construction on our land. Eric has been a great help in keeping things going even while we are gone. He will be leaving soon, though, and his help will be greatly missed. The road was "completed" enough to get trucks in with gravel and supplies so things have sped up quite a bit since then. There are a group of neighborhood guys out there everyday working, shoveling gravel, etc. And we have two containers out there now too to keep tools and things in. The three bible studies are still going strong out near our land. We continue to go and support each Sabbath, rotating between each one. The church members are so dedicated, they are walking in the dark for several miles in the evenings to visit and continue the Bible studies. A couple of them are going full time during the day also to other interests as well in preparation for some upcoming evangelistic meetings being held up and down Palawan. It's a privilege to work here. The needs that surround us are huge and the opportunities never ending. We are continually amazed how God is working and opening up doors. Thank you so much for your prayers and support that keep this mission going! Time is near. May we all keep our focus on the finish line.